Perhaps no decade is so immortalized in American memory as the 1960s. Couched in the colorful rhetoric of peace and love, complemented by stirring images of the civil rights movement, and fondly remembered for its music, art, and activism, for many the decade brought hopes for a more inclusive, forward-thinking nation. But the decade was also plagued by strife, tragedy, and chaos. It was the decade of the Vietnam War, of inner-city riots, and assassinations that seemed to symbolize the crushing of a new generation’s idealism. A decade of struggle and disillusionment rocked by social, cultural, and political upheaval, the 1960s are remembered because so much changed, and because so much did not. The following sources offer insight into the decade’s impactful history. On June 4, 1965, President Johnson delivered the commencement address at Howard University, the nation’s most prominent historically black university. In his address, Johnson explained why “opportunity” was not enough to ensure the civil rights of disadvantaged Americans. The National Organization for Women was founded in 1966 by prominent American feminists, including Betty Friedan, Shirley Chisolm, and others. The organization’s “statement of purpose” laid out the goals of the organization and the targets of its feminist vision. From Selma to Montgomery, 1965. Library of Congress. Civil rights activists protested against the injustice of segregation in a variety of ways. 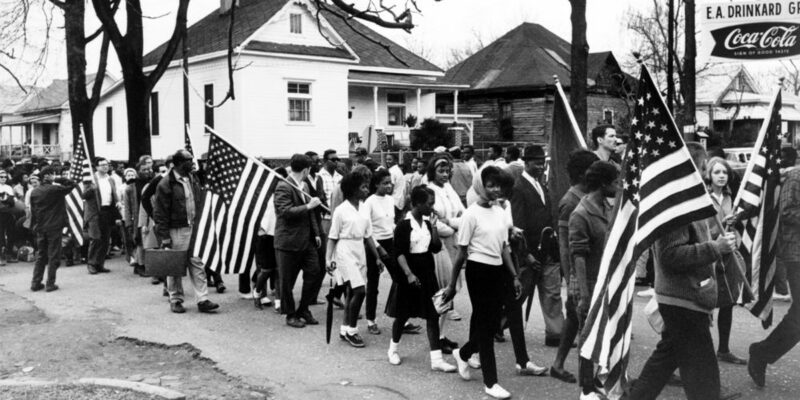 Here, in 1965, marchers, some carrying American flags, march from Selma to Montgomery, Alabama, to champion African American voting rights. Photograph, January 18, 1964. Wikimedia. As civil rights demonstrations rocked the American South, civil rights legislation made its way through Washington D.C. 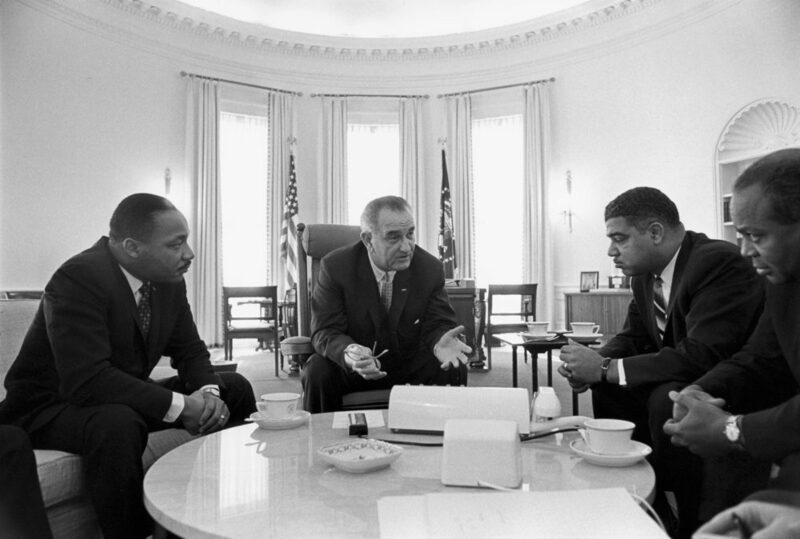 Here, President Lyndon B. Johnson sits with civil rights leaders in the White House. 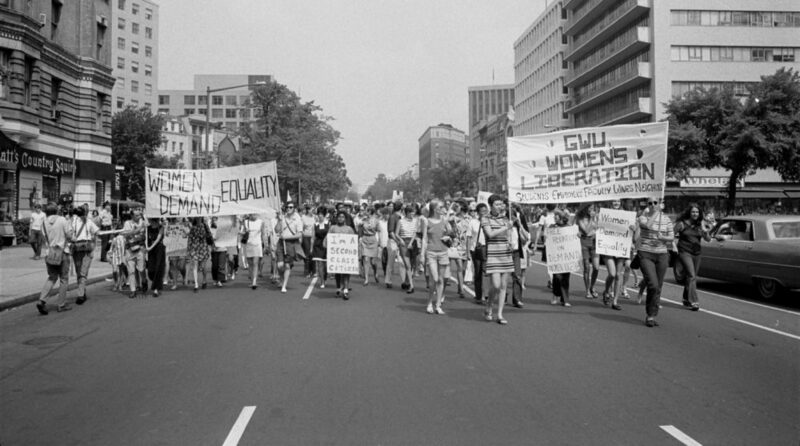 Warren K. Leffler, Women’s Liberation March from Farragut Square to Lafayette Park in Washington, D.C. 1970. Via Library of Congress.